Men's Herringbone Wedding Ring : LOVE2HAVE in the UK! 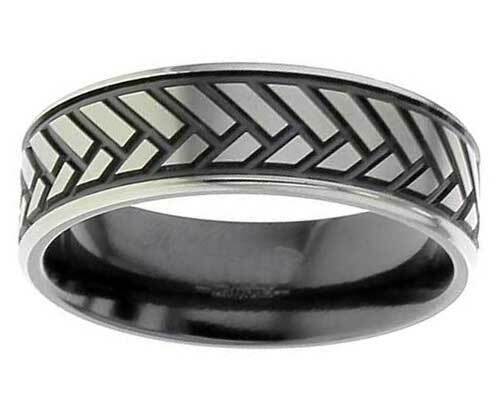 A men's wedding ring with a V-shaped Herringbone pattern. This pattern is regularly seen on floor tilings and road pavements as it has an exact geometric tessellating design which is perfect for creating a lovely modern but alternative look to fill modern spaces. The designer has achieved an impressive version of this pattern for this ring that stands out well using a two-tone effect and deeply engraved grooves. The lovely contrast, achieved by treating the zirconium with heat, so it turns black and then is machined away to reveal the brick shaped tessellation that runs right around the rings outer. The ring features a chamfered edging to finish off the geometrically pleasing design. It is available in a polished or satin finish and measures 7mm in width.